Melbourne’s reputation as a foodie and shopping mecca will be the last impression left with millions of international travellers, as Melbourne Airport today unveiled its newest renovation. The luxury retail and dining precinct within its International Terminal (T2), now includes some of the world’s most desirable fashion and accessories brands, along with exciting bars and restaurants and a brand new duty-free shopping experience. Australia’s busiest 24/7 airport has seen its international passenger numbers grow by 46 per cent over the past five years – and is expected to welcome more than 60 million visitors annually by 2033. The new retail and dining precinct in T2 is part of the airport’s commitment to bring the city’s world-renowned shopping, food and beverage experiences to life at the airport. 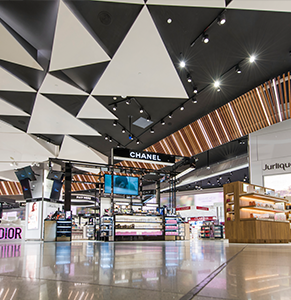 Chief of Retail at Melbourne Airport, Andrew Gardiner, said: “The vibrant redevelopment has been designed with the modern traveller in mind. Joining Burberry in T2 are retailers including jeweller Tiffany & Co., luxury fashion and accessories brands Salvatore Ferragamo, Max Mara, Bally, Emporio Armani, Michael Kors, HUGO BOSS and Furla, leading luxury luggage retailer, Tumi, and specialty watch store, Watches of Switzerland. On the dining front, travellers can enjoy a truly Melbourne pre-flight culinary experience at one of six hospitality venues, including a revamped Café Vue by Shannon Bennett, Bar Pulpo by Movida by Frank Camorra and much-loved restaurant Two Johns. For the first time newly announced BaXa (opening late December 2017), Urban Provedore and Brunetti from the Angele Brothers will also be available airside within T2. Travellers can also take advantage of the airport’s new duty-free shopping experience, which is the second of Dufry’s next generation concept stores to open worldwide.